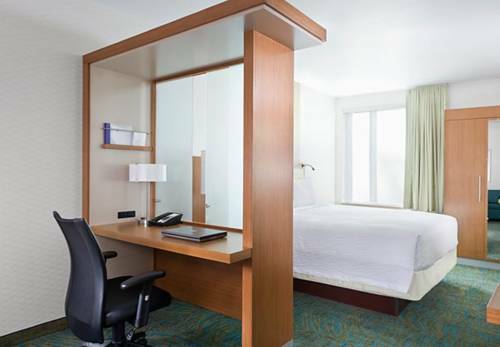 Welcome to the SpringHill Suites by Marriott Philadelphia Langhorne, where you'll have the space you need to get things done or unwind and relax in comfort. Located just next door to Sesame Place, we're a connected walkway to the park and near Oxford Valley Mall. It's easy to explore the Langhorne area or take a day trip to nearby Trenton, NJ; Philadelphia or Newtown, PA. Unlike other hotels in Langhorne, our stylish and smartly designed suites are 25% larger than average, giving you room to succeed. Our rooms are cleverly divided into spaces for recharging, relaxing and connecting. Each room contains a pullout sofa with comfortable, flexible seating. Great extras add to a sense of home, like plush bedding and complimentary WiFi. Start the day at our free hot and healthy breakfast buffet, exercise in the fitness room or take a dip in our indoor pool. Our onsite meeting space features ample seating for small business groups complete with ergonomics chairs and plenty of natural light.